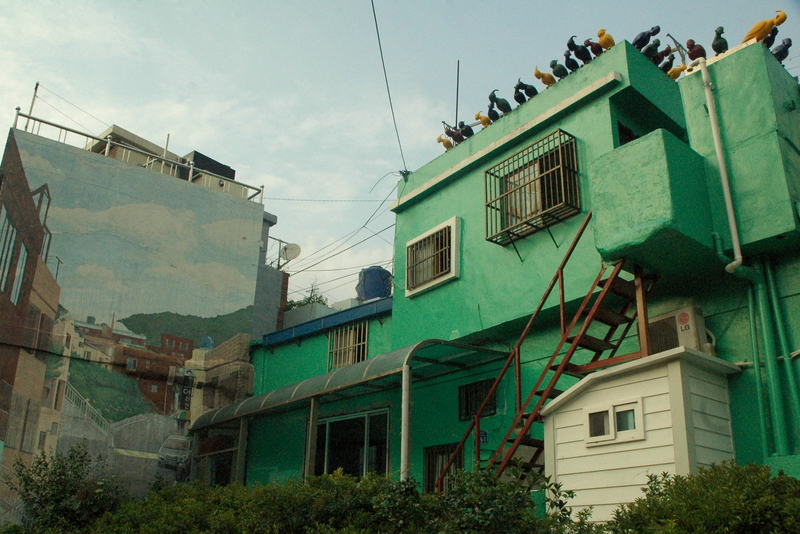 Located in Busan, the Gamcheon Culture Village was a place of refuge for people during the Korean War. 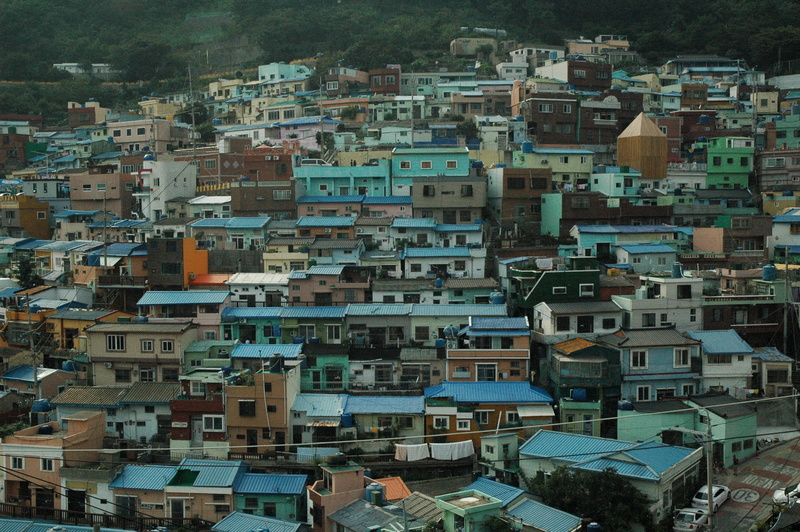 During the war, over 4,000 Taegeukdo (a religion based on the ideology of Jeungsan) believers formed this settlement. 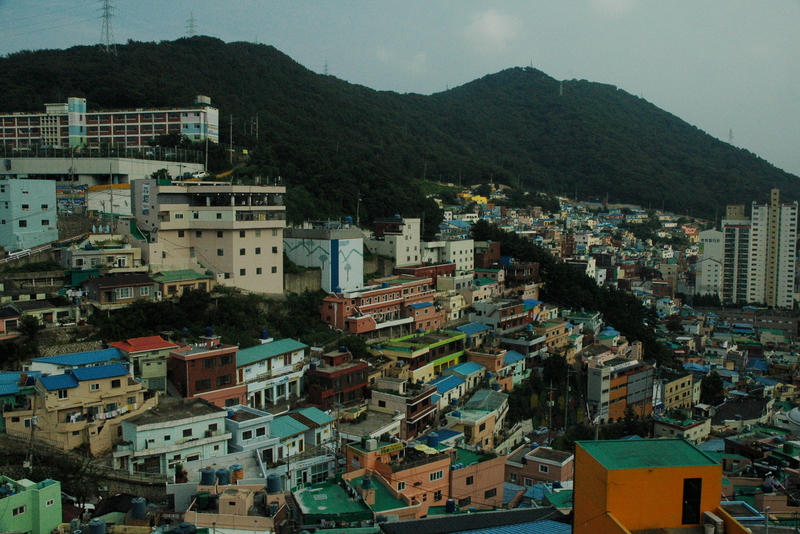 Monica, Brent, and I took metro line 1 (orange) to Toseong and then caught the local bus, Seogu 2, to the top. You can take local buses Saha 1-1, Seogu 2, or Seogu 2-2. The buses are really small, so we could not fit into the first bus that came our way. It was a bit cloudy and the sun was about to set, so my pictures will fail to do the place justice. In Europe, I grew accustomed to red roofs. At Gamcheon I was treated to vibrant blue ones. 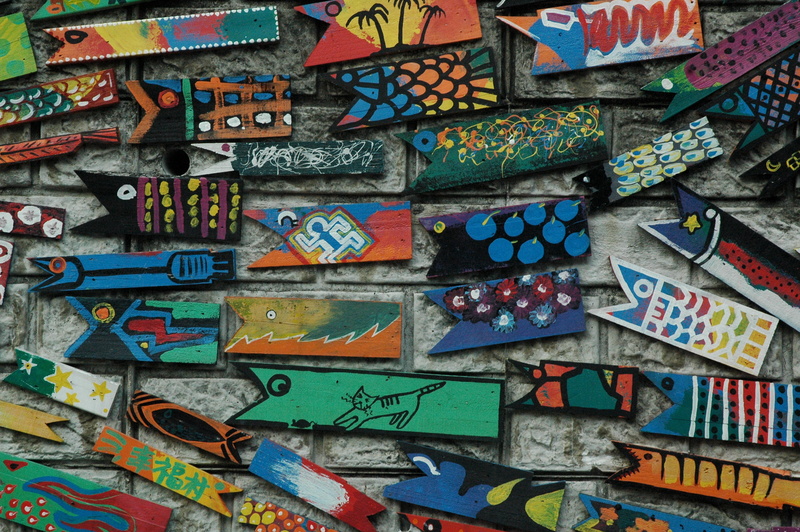 The buildings were all different colors and many had murals on them. The art installations around the village were magnificent. 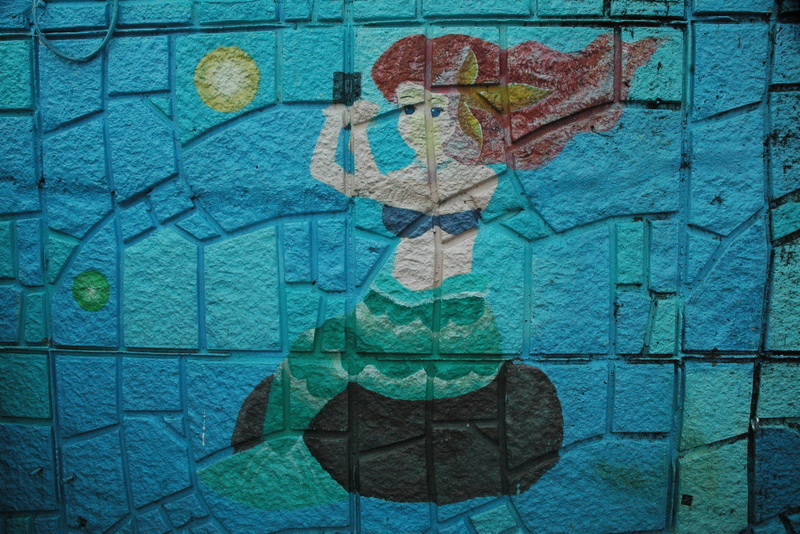 Ariel from The Little Mermaid taking a ‘selfie’, a staircase of books/bookshelves, and bird sculptures with human faces are just a few examples. My favorite ones were life-size figures of the prince and the fox from Antoine de Saint-Exupéry’s The Little Prince, which just so happens to be my favorite book. Back in my college days I was a resident advisor and made a bulletin board about the novel. I also have a copy of the book in Hungarian and a necklace my older sister, Maricel, got me. Anyway, the line to take a picture with the prince was too long, so I snapped a picture of two friends loving on it instead. 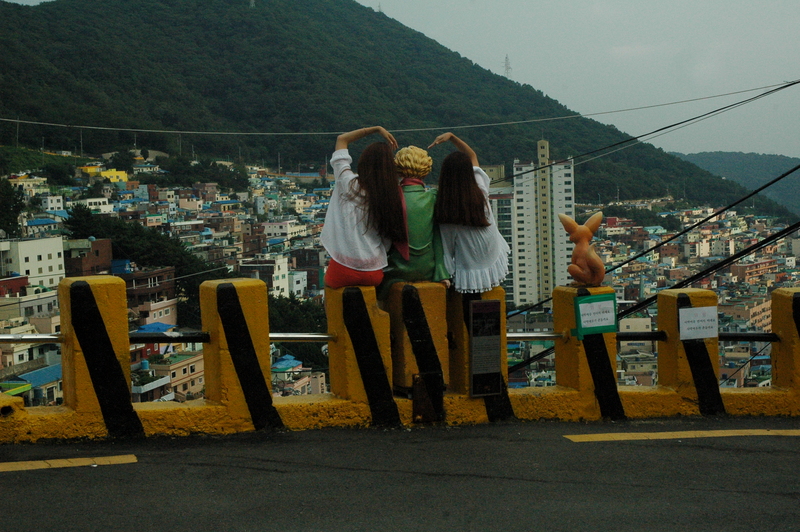 After walking down a flight of stairs in an alleyway, we made our way to a bus stop that was at the bottom of the hill. Out of nowhere a kind-looking elderly lady came towards us. For some reason I am always the one that gets approached even though I know the least amount of Korean (this will change soon). Eventually she moved on and ended up grabbing Brent by the hand and started leading him towards what we figured was the doorway to her house. We have no idea what she wanted, but Brent managed to politely escape. All parties were confused by the exchange. I wish I knew what she wanted. Part of me feels like she wanted to share a meal with us in her home. I am not one to take chances though. If you are interested in knowing more about the village and cannot visit it yourself, a KBS (Korean Broadcasting System) variety program called Stars of 2 Days and 1 Night explored “every nook and cranny” of the village in a few episodes in 2014. I watch two KBS variety shows: Happy Together and Hello Counselor. The goal is to end up in the audience for Hello Counselor. I need to learn Korean before I go though. Our next stop was the Jagalchi Fish Market, which I will highlight in my next post. Fact: I am horribly afraid of fish.